This is an English vegan dish. Vibrant colours are matched with clear flavours in a beautiful, interesting salad dish. Unusually, this dish works both as a hot dish and as a cool dish. 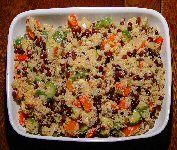 Quantities given are for a generous 8 portions as a party salad. Soak the aduki beans overnight and then cook in the usual way. Once cooked, discard the cooking water, and wash the beans. Zest and juice the lemon (I use a grater for the zest and a lemon squeezer for the juice). Boil the water and warm up the orange juice, and put these together with the couscous, zest, lemon juice, cinnamon and salt in a large bowl. Allow to marinate for 20 minutes or more. De-pith the capsicum and chop into 1 cm pieces. Trim the courgettes and chop into small chunks. Peel the mushrooms and chop large. Peel the mango and cut the flesh into pieces much like the capsicum and mushrooms. Discard the stone. Stir fry the vegetables in the oil starting with the onion, garlic, ginger, and capsicum for 2 minutes. Add the courgettes and stir fry 3 minutes. Add the mushrooms and stir fry 2 minutes. (Stop there if you like the veg crunchy, go on for another 5 minutes if you like them softer). Add the stir fry veg to the couscous, which should be nicely plumped, and turn gently. Add the aduki beans, mango, tomatoes and chopped nuts and turn gently. Add the chopped herbs and check seasoning, adding salt and pepper to taste. This dish can be warmed through in a pre-heated oven at gas mark 3 (165 °C; 325 °F) for 20 minutes, or it can be chilled in the refridgerator and served cold. If no mango is available, use a handful of sultanas to give a sweet hint. Substitute 20 ml of mixed seeds (choose from what is in the larder such as sesame, sunflower, hemp, linseed) if you wish to avoid the nuts. 5 ml dried mint plus 5 ml dried basil can be used in place of fresh herbs. When chopping vegetables, try to make the pieces much the same size, and for this dish I like the pieces to be bold! Left over portions do not keep very well as the vegetables tend to go limp.